In recent years, the Korean company Zalman Tech Co., Ltd. has “slowed down” and has encouraged fans of their products with innovations not as regularly as before. Apparently, the company believes the existing range of air cooling systems for CPUs is comprehensive for PC and the value of any class. Indeed, today it consists of 42 models of various types, weight, and cost effectiveness. One of the most recent released Zalman models is model Zalman CNPS9800 MAX, which will be discussed in today’s article. 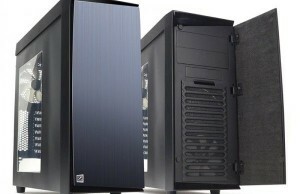 New Zalman CNPS9800 MAX structurally has much in common with the model Zalman CNPS9900DF. 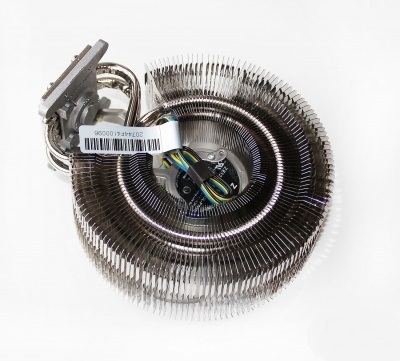 The same radial radiator with thin edges and shiny nickel-plated, the same 120-mm fan (but one) and all of the same intricately curved heat pipes. The novelty looks really attractive. This new cooler has become narrower and lighter, because is actually decreased by one section. Now, a thickness is only 52 mm and not more than 150 mm. Such a small thickness of the cooler is achieved due to the fact that the fan is recessed into the radiator, although, of course, the latter because of this has seriously lost in the area. Due to additional slits in each plate and bent downwardly upper edge of the enhanced efficiency of heat transfer between the plates and the heat pipes. The total number of plates in the radiator is equal to 119, the thickness is only 0.2 mm, and the intercostal spacing varies from 1.0 mm for pipes up to 3.0 mm at the edges of the plates. 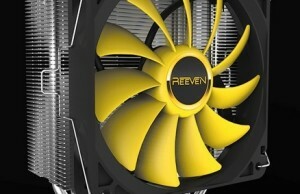 Without fan radiator Zalman CNPS9800 MAX resembles a bee without a bottom. It is appropriate to say about proprietary TAC technology – increasing the airflow through the radiator chased away by aspherical shape of the plates. 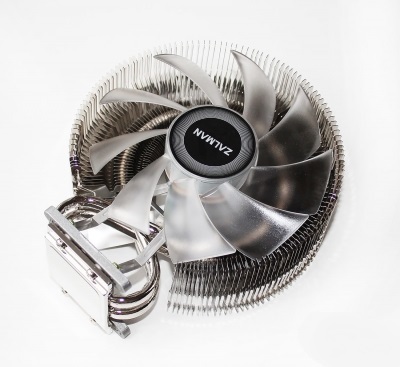 Fan of Zalman CNPS9800 MAX is fixed on a metal rack screwed to the bottom of the cooler. Diameter of substantially transparent impeller equipped with nine lobes and illumination is 113 mm and the speed of its rotation is regulated by pulse width modulation in two ranges: from 1000 to 2200 rev/min, and – when incorporated in cable chain with a resistor – from 900 to 2000 rev/min. 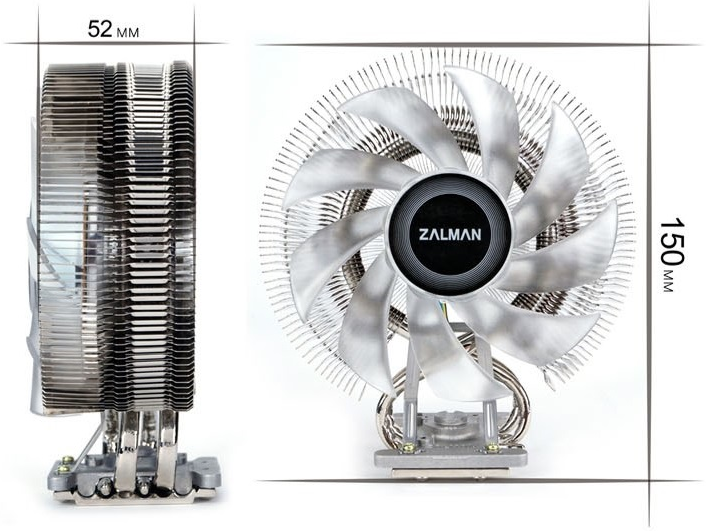 The airflow and static pressure of Zalman traditionally are not specified in the specifications. On a foil sticker of fan stator with diameter of 43 mm is specified model, and electrical characteristics and the type of bearing. Zalman CNPS9800 MAX is compatible with any modern platform for Intel or AMD. The installation procedure is very detailed and is availably described in the instructions, which can be downloaded from the official Zalman website, and for any platform begins with fixing rails to the bottom of the cooler.